Here at RecRight, we care about our customers’ opinions. That’s why every year we conduct a Recruiter Survey that maps the attitudes and experiences of you, dear recruiters. According to your answers, we aim to develop our service in a direction that will make your jobs more pleasant and efficient. Therefore, we have assembled an e-book based on your responses that you can download for free here. In total, we received answers from 172 respondents. The survey contained 15 questions regarding our tool and the experiences our customers have had with it. 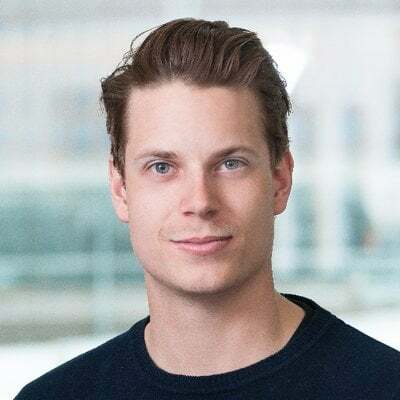 In this post, I will respond to some of the frequently asked questions by recruiters, and back my answers with the data gathered from the survey. I hope this information will prove to be helpful to you. Question 1: When using video interviews, how many questions do you normally ask? The optimal number of questions is a common inquiry among our customers. Since video interviews aim to make the recruiting process more efficient and save time, we often emphasize that less is more. We usually tell our clients that a good number of questions per position is somewhere between three to five. According to the answers, most of the respondents place themselves within this range. As you can see, the majority of respondents ask up to 5 questions. Respondents that normally asked more than five questions represented 8.8% of the total respondents. 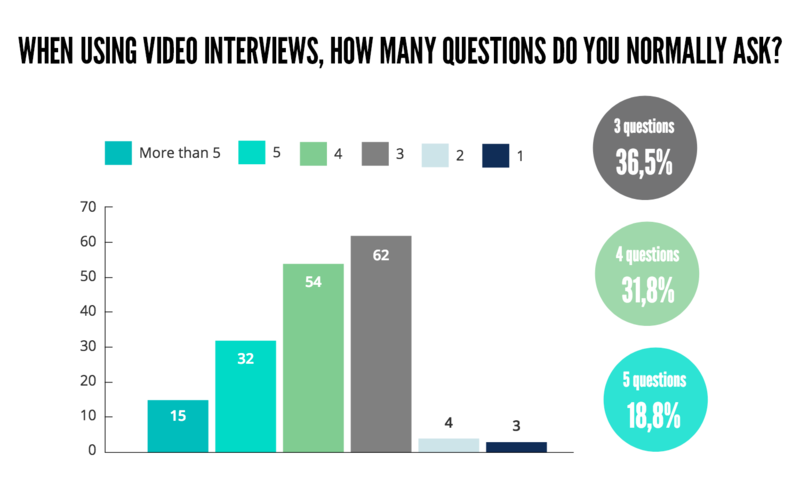 Fewer than three questions had a share of 4.2%, but it’s good to keep in mind that some recruiters who conducted only one question might have been using the embedded video interview, which allows only one video question. We did not take this into account while conducting the survey, so it might cause a minimal bias. 1.8% of the respondents normally ask only one question. Question 2: In your opinion, what is the optimal length of one video answer? 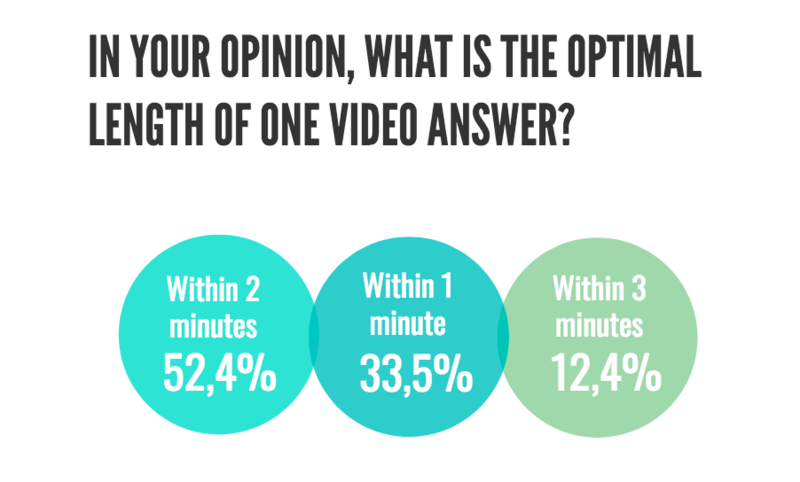 According to 52.4% of our respondents, the optimal length of one video answer is within two minutes. The second largest share of preferences were answers within one minute with 33.5% of the responses. Longer expected answers might translate into fewer questions per interview, so no conclusions of the total duration of the video answers per interview can be made. Question 3: According to your estimation, how much time do you or your team spend on recording one video question? It can be difficult to estimate how much time creating a video question takes if you are new to video interviews. Of course, the first questions might take more time, but after you are getting used to the tool and the recording situation, recording new questions will be hassle-free. 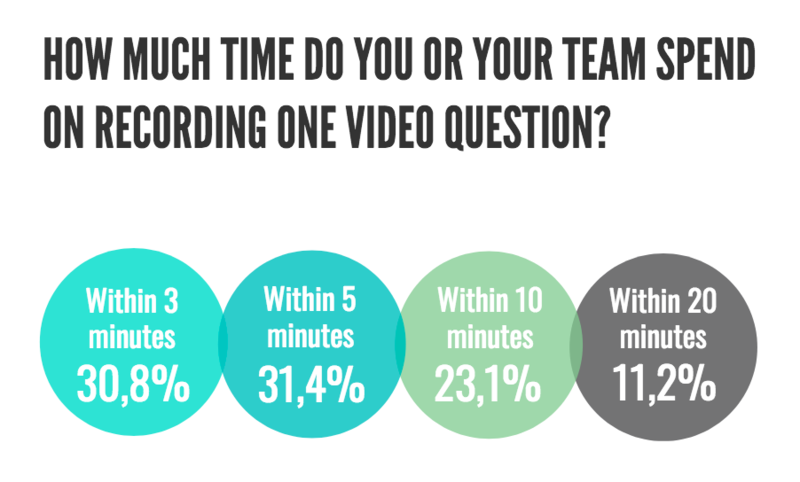 62.2% of our respondents spent five minutes or less per one video question. Within this group, 30.8% spent three minutes or less per video question, and 31.4% spent on average more than three but less than five minutes per video interview question. Even with video interviews consisting of five questions, it will take less than 30 minutes to create a video interview. The third largest share are recruiters who record a question within ten minutes. They represent 23.1% of the respondents. 11.2% of the recruiters who conducted the survey spend 20 minutes or less per video question. These numbers seem to be pretty typical, as they are within the range that we are used to hearing. It’s of course totally okay to spend more time on recording your questions as well. Sometimes a question might involve several components, like a demonstration or multiple interviewers for example. It’s not uncommon to spend more time recording these kinds of questions. Some recruiters also prefer sending out very refined questions that have been recorded using professional camera gear, which naturally takes more time. It is probable that perfectionism also plays a part here. The share of recruiters spending 40 minutes or less per question, and recruiters spending more than that, are both 1.8%. Question 4: According to your estimation, how much time do you spend reviewing one candidate’s videos? 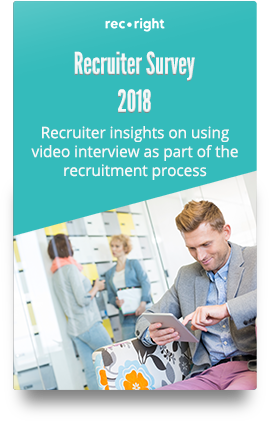 Another factor that considerably affects the duration of the video interview process is the time spent screening candidates. 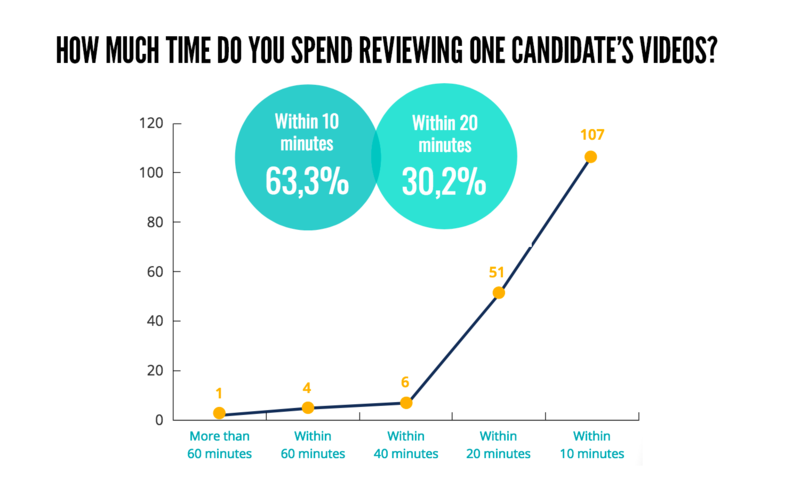 The majority of our respondents spent ten minutes or less screening a single candidate. According to these numbers, screening ten candidates takes approximately one hour and forty minutes, though the real duration could be less since the minimum duration suggested in the survey was ten minutes. 30.2% of the recruiters spent more than ten minutes but less or equal of 20 minutes per candidate. It was rare to spend more than 20 minutes screening a single candidate. 2.4% of the respondents screened a candidate within 60 minutes and 0.6% spent more than two hours per candidate. None of the respondents spent more than one hour but less or equal of two hours on one candidate. From the survey results, we have assembled a Recruiter Survey e-book, that you can download for free here.